Fresh emoticonset with a classical style for all you old school lovers. Comments, suggestions or bug hints are welcome. The base body is redrawn and rounder now. 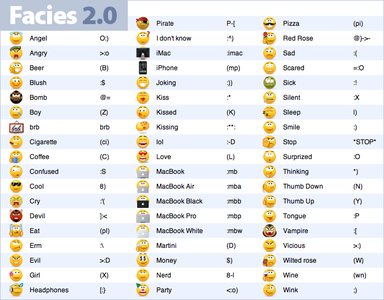 Added a lot of msn emoticons. Added msn and aim shortcuts. Each emoticon has a :name shortcut. awesome update and for me the best set around. a good placed :nerd ( 8-| ) can make your day! also love the a-team facies. keep em coming! The best smilies I've seen in a long time. But the nerd face needs glasses!